It's Black Friday as this goes live, but hopefully some of us are sleeping in, drinking coffee, and doing some online shopping instead of sitting outside in cold weather and battling crowds. 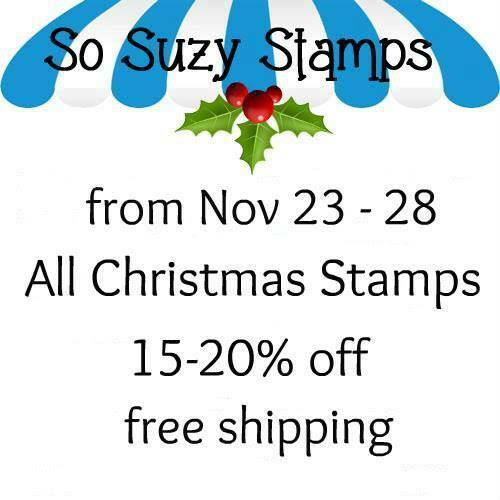 I even have a craft sale to share with you in this post if you are into crafty goodness. Since you are reading this I feel there's a great chance you are!! :) Enabler alert! I'll stop the rambling now to share the secrets of this card. I have to tell you that this background has definitely been a work in progress for awhile. 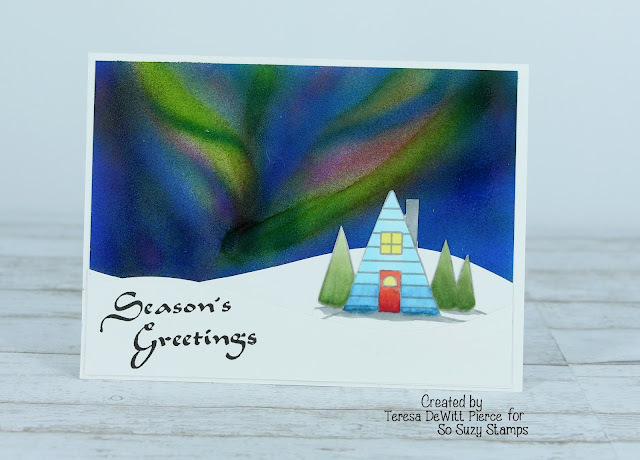 I searched high and low for ways that other crafters have made an Aurora Borealis background for a card. I turned to a technique that I used to use for decorating cakes - airbrushing. I still have a Kopykake airmaster system that has been sitting around gathering dust for years. I had the thought that the Ranger alcohol inks are a very thin medium that wouldn't clog up an airbrush so I decided to give it a go. Beyond the background, here's what I did for the focal point of the house. I used a curved die to make two snow banks from white cardstock. I stamped the house stamp onto a separate piece of cardstock, colored it with Copics, then fussy cut around it before gluing down on the right hand side in front of the "rear"snow bank and then placing the "front" snow bank on top. I hope that makes sense. 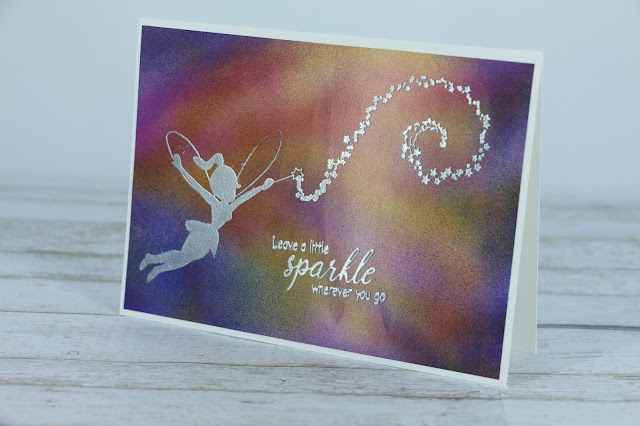 I stamped the sentiment in black ink on the left side snow bank and layered the background piece onto a white card base, leaving some room around the sides for a frame. Here is another card where I used an airbrush to create a background, but the color is more spread out than concentrated in very specific places as shown above. The best part of all, is that this coated paper is less expensive than the Yupo since a 10 pack of 5"x 7" Ranger Yupo is about 10 dollars. A package of 50 sheets (80 lb glossy white) of the coated paper is $11.25. So quite a savings - link is at the end of this post. Of course that only makes sense if you will be doing a lot of alcohol inked backgrounds. I originally bought this paper for another purpose and still had a lot left so I'm happy to have found a great use for it. If I had been thinking about it, I would have used greens in the background below since Tinkerbell is my favorite fairy - oh well next time. Like the stamps used below? I have linked up to those as well. I am adding a short video (no voiceover on this one) that demos the airbrushing process used to create the card backgrounds above. 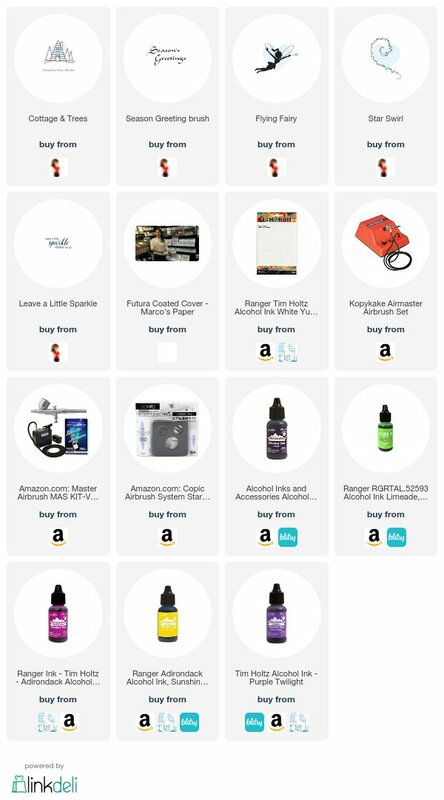 Since there are many types of airbrushing tools, it would be difficult to apply what works with my airbrush to every other system. It is truly a skill acquired by lots of practice to get used to the flow of ink and controlling it by increasing or decreasing distance between the airbrush to your surface and how much air pressure is coming through. Since it is, after all, Black Friday, below is the sale announcement I mentioned where you can save up to 20% off on Christmas stamps, including the newest release through November 28, 2017 and get free shipping on your order at So Suzy Stamps. The stamps I used today will be linked at the bottom.